To make sure theory and reality are the same, Circa arranged a test to destruction. A section of belting or rub rail extrusion was bolted to the concrete floor with a standard socket design welded in place. We wanted to confirm both the load capability of the system and that the stanchion would fail before damaging the welded socket. 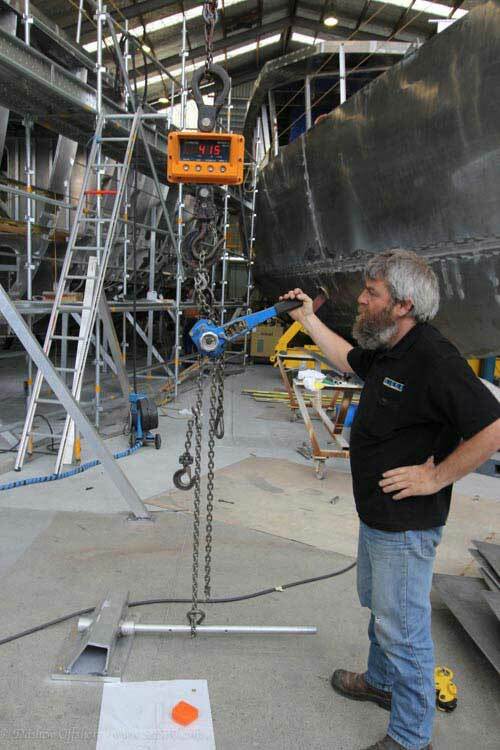 With the chain attached 250mm from the stanchion base, a load was applied via the load cell. Stanchion base was checked for roundness before the test commenced. First a load was applied up to 500 kg so there was obvious deflection, then the load was removed. The stanchion returned to its original straight position indicating we were still within the elastic limit of the tube. The tube began to yield at around 650 kg and broke at 780 kg. 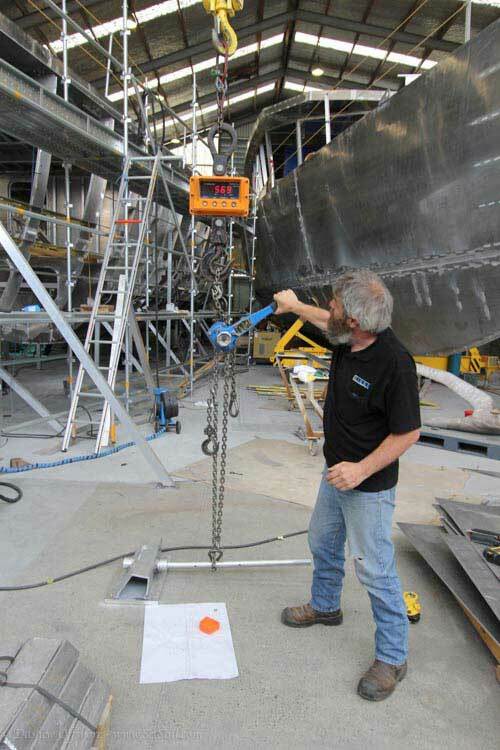 The stanchion base was rechecked for any distortion or out of round, but it was still the same as when the test began. Finally the bolt holding the stanchion into the base was removed and the stanchion slid easily out of the stanchion base. Breaking at three quarters of a ton might seem like overkill, and for keeping crew aboard as a lifeline stanchion this is a bit over the top. But what we are really concerned about is damage tolerance when rafted with larger vessels, and/or against commercial wharfs. And when damage does occur, we want to have an easily removed stanchion. Looks like we have that wish fulfilled. This entry was posted on Tuesday, October 28th, 2014 at 12:04 am and is filed under Details, FPB 78, three. Both comments and pings are currently closed. My first boat had spotless fiberglass, beautiful finished teak, and bright stainless. My second boat had Imron, beautiful finished teak and bright stainless. I evolved, and on subsequent boats after maintaining same (or paying someone else to), Iron Lady (our FPB 64) we have no fiberglass or Imron, no exterior teak (unfinished or otherwise), and only minimal stainless (all 316L). I still hate polishing stainless and that is the last weak link. On our 78-3 – none of the above. The only Imron on the boat will be the black used to paint all the masthead electronics (love that military look). In Cooks Bay on Moorea in French Polynesia, we were nicknamed the “Gunboat”. Love it. Love all the engineering-based posts. In this case I have to ask why the test load was placed so low on the stanchion? Seems like a real-life load from hands, hips, or other impact would be more likely to load the stanchion at the top. Assuming a normal stanchion height, the breaking load at the top will be maybe a third of the load shown here. Would have made for a safer test, as well, no? Just curious, in case I’m missing something. If you compare these aluminum stanchions to what we have used fir years in stainless they are as strong or stronger. Our concern was not damaging the socket when the stanchion reached its elastic limit. The test was at the midpoint of the stanchion. Would not the force of a human body be at the upper end of the stanchion? This would, I suppose, change the the result of the test significantly. We are not concerned with human force. We think these are fine for that. What we were concerned about was rafting with commercial fishing boats where their belting (rub rail) is just above ours. The problem is when they come alongside, as I am sure you have experienced. 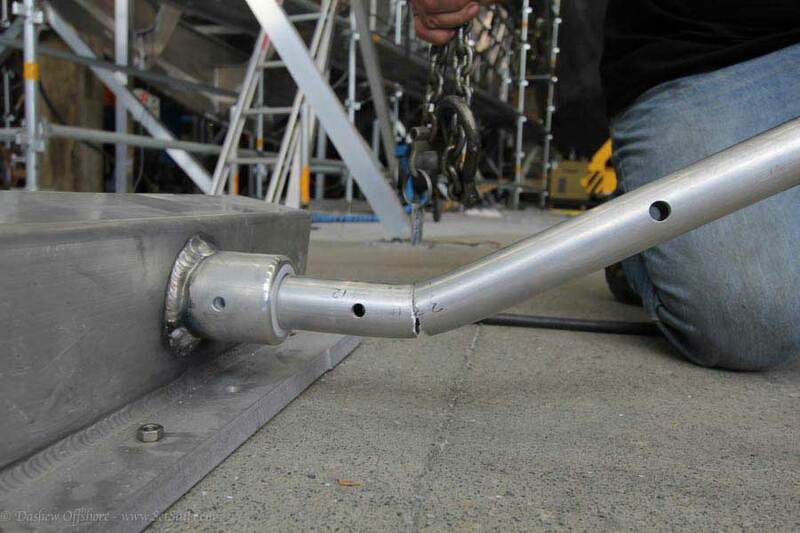 We wanted to be sure the stanchion would fail before the socket was damaged, so the stanchion could be easily removed. Hence the low postion of the force. Between the strength of the thick walled stanchion at 38mm diameter (6mm wall) and the load sharing that occurs with the other stanchions from the lifelines, there are high factors of safety for bodies headed overboard. On the other hand loaded from the outside in when rafted with larger vessels there is no load sharing as the lifelines go slack when the stanchion bends inward due to the shape of the deck edge.The test was to verify that the socket would be OK after a stanchion failed. 1) I think it is interesting that the stanchion did not break where either of the lifeline holes where drilled. 2) My alloy boat has had anodized stanchions for 25 years. Two were replaced with non-anodized replacements after getting to close too a mangrove forest during a hurricane in the Caribbean. After all these years it is hard to tell the difference between the two unless you get up close. Not sure the anodizing is worth it. What type of aluminum did you use to fabricate the stanchions? Is it the same 5083/6 used elsewhere, or something else that may become subject to corrosion fatigue with time passage? I know that ALCOA has new alloys which area available in various shapes and extrusions that may be of interest in such areas. But this is a great idea as any stainless would be so much harder than the socket hole it would also need repairs. For this, Rod, ordinary 6000 series.